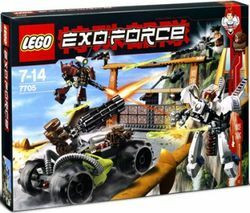 7705 Gate Assault is an Exo-Force set released in January 2006. It includes five minifigures, namely three Iron Drones, Ha-Ya-To and a Tank Gunner. It contains 402 pieces and is recommended for children aged 7 to 14. The set is mainly made up of four parts: the gate, the Gate Defender (Ha-Ya-To's vehicle), the Sentry II (the maroon Robot vehicle) and the battering ram, the Robot Rammer X1. The gate is rather well defended, with a missile cannon, two other missiles, and a long blaster. When the gates open, the missile cannon fires automatically. Behind the gate is a framework of TECHNIC pieces that hold it up. The sides and roof of the gate are made up of long orange pieces, 1x16x2-4. The Tech sits behind the long blaster and works it. The Gate Defender is mainly white. It has an antenna extending upwards from behind where the pilot stands. It also has two white wings, although smaller than the Stealth Hunters. The legs and feet are built in a similar way to the Uplinks, although the legs have long and thin plates instead of shorter and wider. The right hand has a main blaster, with a pair of binoculars connected next to it, and four other guns in a vertical row underneath the main barrel. The left arm has a hand made up of four white robot arms: three for fingers and one for the thumb. The cockpit has the same type of canopy as the 7701 Grand Titan. The Sentry II is similar to the Sentry, although maroon instead of dark sand, and with spikes. The robot sits in the front, unprotected. Behind him, there is an engine, with a green ball inside it. Next to it, there is an antenna. On the left arm, there are two long blasters. On the right arm, there are two missiles, longer than most Exo-Force sets have. The Robot Rammer X1 is mainly black. It has four wheels. Between the wheels, there are lime green pieces from which cords extend. The cords end up at the back of the vehicle. The vehicle is piloted by a Iron Drone. However, he does not have any legs; he is built into the vehicle. The other Iron Drone, who controls the four-barreled, is complete though. The gun is mounted up from the main part of the vehicle and can move. To defend their side of Sentai mountain, the humans built barricades and gates on the bridges connecting the two sides. The robots, unable to breach the gate, built a bridge directly underneath the blocked one. Using their second bridge, the robots burst onto the main one directly in front of the barricade in a surprise attack. The gate was destroyed, but the humans were able to fend off the attackers. The Gate Assault has two alternative models: Swift and Blockade Bulldozer. These can be built from the set at the same time. A LEGO Shop@Home catalogue states that Ryo was included, though it is actually Tank Gunner. This is a description taken from LEGO.com. Please do not modify it. Hold the robots at the gate! Can the humans prevail against the robots and stop them from taking the First Gate? With skill, cunning and powerful weapons on their side, the humans and their micro-Battle Machine make a powerful defense against the robots' micro-Battle Machine and Attack Tank! Includes 2 human pilot minifigures and 2 Devastator robot pilot minifigures! Human minifigures have heads that turn to change facial expressions! Gate measures over 11 inches (28cm) wide! Open the gate to activate the cannon! Robot Attack Tank is over 6 inches (15cm) wide and has massive 1.5 inch (4cm) tires! Rebuild the Gate Assault into a robot Blockade Bulldozer and human Swift Plane for more exciting battles. See www.EXO-FORCE.com for building instructions and more building inspiration photos. Facts about "7705 Gate Assault"
Hold the robots at the gate! This page was last edited on 28 April 2016, at 21:03.